6’10 is a spinoff of Celtic punk troupe Flatfoot 56. But where Flatfoot is all hard charging rock n’ roll, 6’10 is softer, more introspective acoustic rock. The band has released a couple of singles but this is their first full length effort, and as such it contains a little extra polish, without losing that live off the floor feel that fits the music so well. The songs are all tales told as if by a campfire. Folksy thoughts and reminiscences from a life spent wandering and wondering. 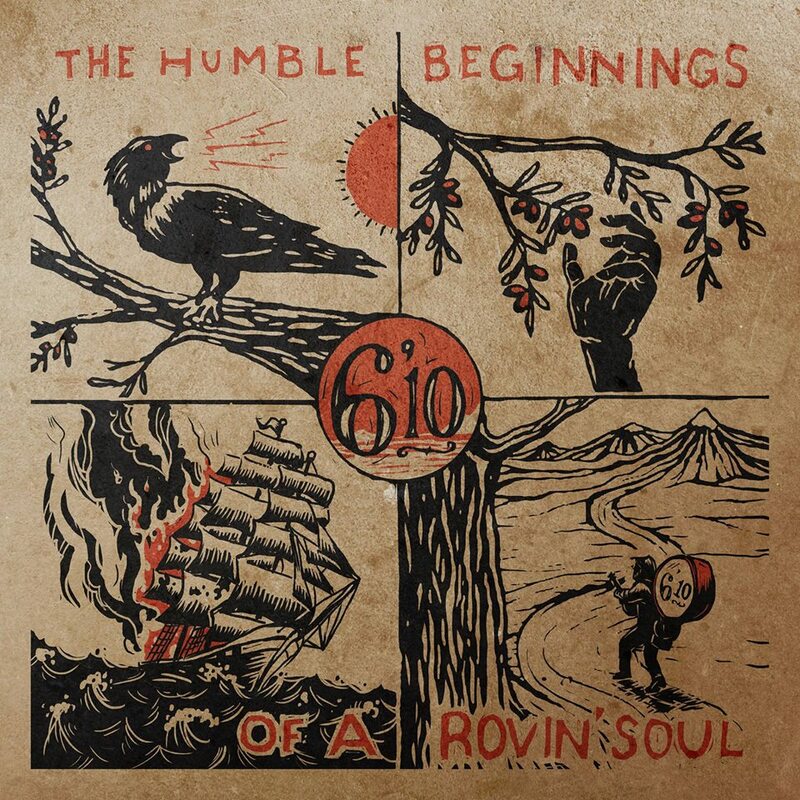 The title of the record, ‘The Humble Beginnings of a Roving Soul’ fits the bill and the cover of the album compliments it. Four snapshots sketched in ink, probably freehand, highlighting four journeys in the songs on the record. It all has the look and feel of a storybook. An old, vintage collection of short stories that have been passed down through the generations. The same rugged feel of the music itself. There’s something attractive about stripped down, soul baring expressions of self in acoustic form that punk bands seem to gravitate to. It seems these days as if every punk band has at least one member who has an acoustic side project. I don’t mind though. I love the raw, organic sounds and heart on the sleeve sentiments of bands like 6’10. And I love when the covers of their albums perfectly encapsulate that. Any good album cover is a cover you would hang on your wall, and ‘The Humble Beginnings of a Roving Soul’ is a cover I would hang on my wall in an instant.